See how easy it is to make a little yarn octopus that is the perfect size, about 5", to hang on your backpack. It also makes a terrific gift or craft bazaar sale item. 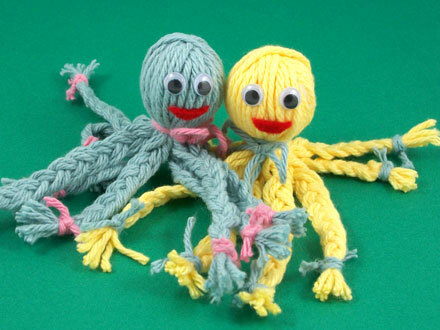 Each octopus only takes a little yarn to make —about ¼ ounce. These little cuties are just right for your yarn leftovers. This is a great project for groups of kids or family craft time. Two four-ounce skeins of yarn in contrasting colors will make over 30 little yarn octopi. Making small balls of yarn for each child will make the craft go faster. 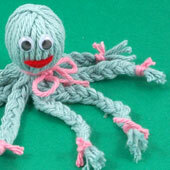 Related craft: Make a Woolly Octopus by winding yarn around a book. This is a technique popular in Britain for quickly making a cuddly octopus. Cut twenty-four 12" (20 cm) pieces of the primary color yarn. Cut eight 4" (8 cm) and one 12" (20 cm) pieces of the second color yarn. Lay the yarn on a flat surface so it looks like the spokes of a wheel, with the middle of each piece of yarn crossing all of the other yarn pieces at the center of the wheel. It is best to lay out two or three pieces of yarn together as you go around the wheel. Put a small wad of cotton, about 1" in size, in the center of the wheel. To form the octopus' head, gather the pieces of yarn up around the cotton and tie them together with a 12" piece of the second color yarn. Make sure to tie a secure knot. Adjust the pieces of yarn to cover the cotton completely. Tip: Get a friend to help with the tying. Separate the yarn into eight groups of six. Braid each group, tying the ends with a piece of the second color yarn. You will end up with eight braids that form the octopus' eight legs. Tip: Gently hold the octopus' head between your knees as you braid. Glue two wiggly eyes onto the head. 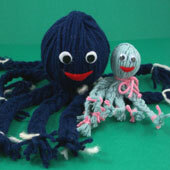 Use yarn or felt to make a mouth for your octopus and glue it on the head. Once the glue has dried, you can play with your new little toy. 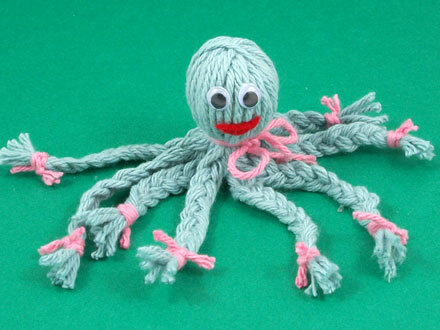 Tip: Slip a length of yarn under a few strands of yarn on the octopus' head to form a hanger. Tie a tight knot close to the head, then tie the octopus to your back pack. That's it! Your octopus is done! Thanks to Lyndsay F. for sharing this craft idea with Aunt Annie's Craft Exchange in 1996. Lyndsay commented, "This was one of my favorite projects at YMCA arts and crafts camp." 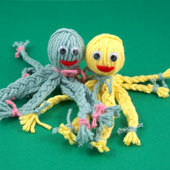 Tip: Make a buddy for your yarn octopus. Tip: The same technique can be used to make other sizes of yarn octopi. 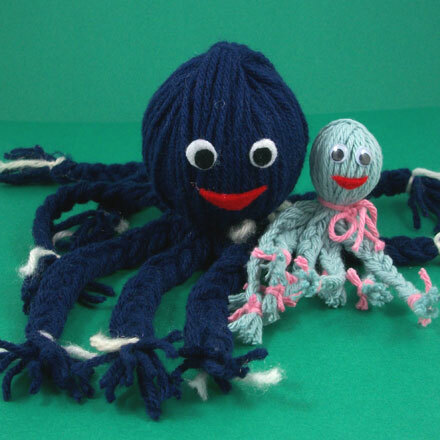 For a larger size of octopus, double the length and number of yarn pieces, and use a 2" foam ball for the head. Instead of using wiggly eyes, cut circles from white and black felt to create eyes.